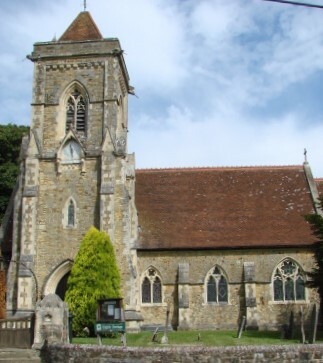 The need for a church in this hamlet in the parish of Battle was recognised in correspondence of 1839 between the Dean of Battle and the ICBS. However, only after Sir Godfrey Webster of Battle Abbey died in 1853 did his widow provide the means. Together with the adjacent school, its house and the parsonage, the architect of the new church was S S Teulon (B 12 (15 April 1854) inside cover), who also designed several cottages nearby (M Saunders p42). The church, built of dark, uncoursed sandstone with lighter dressings, was consecrated in 1856 (ibid). Though Teulon’s work is often idiosyncratic, here he designed a mostly straightforward though competent essay in early C14 style, with a north aisle and south west tower, the base of which serves as porch. 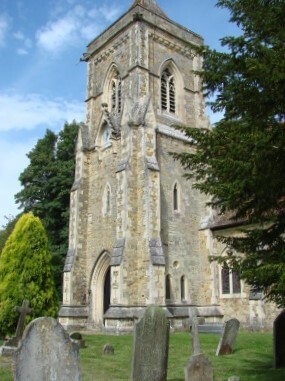 The tower has a plain parapet and low tiled pyramid in place of the planned octagonal broach spire with lights (M Saunders p41), which would have given a stronger emphasis to the exterior. Almost the only sign of Teulon’s weakness for the jagged and restless is the way that the gable of the clock breaks the sill of the south bell-opening. The north arcade is plain, but the chancel arch has foliage capitals by T Earp (Faber Guide p95), who probably also carved the corbels for the arch-braces of the nave roof. 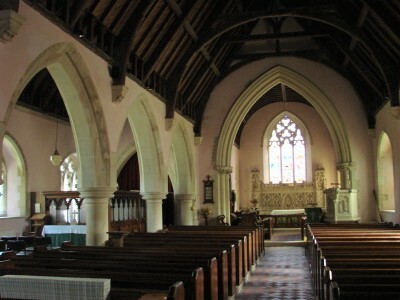 Teulon contrasts open roofs in the nave and aisle with a wagon one in the chancel. His sympathies were Low Church and though there are no galleries, there are Biblical texts above the aisle windows. Originally, there were others above the arcade. 1. (North and south chancel lancets) Monochrome and drawn in surprisingly delicate outline, of a type developed by Teulon (M Harrison pl 30). They show religious scenes set in curling foliage. The cost was six shillings a foot and they were made by ‘Wilmshurst’ (presumably T Wilmshurst) (M Saunders p11). 3. 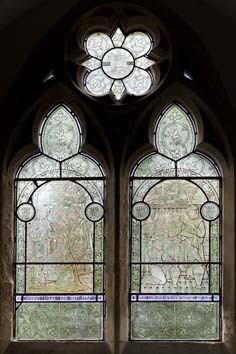 (South nave, first window) A L Moore, 1909 (CDG Aug 1909 p133). 4. (West window) A L Moore, 1917 (signed). Painting: (North aisle) Salome, after Guercino (C17 School of Bologna). 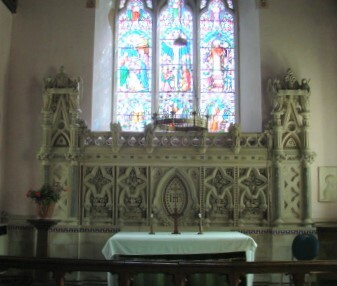 Pulpit: Stone and dated 1889 (following the death of Lady Webster), with carved scenes on the sides. Reredos: Framing the sill of the east window and designed by Teulon in 1859 (M Saunders p41), with marble shafts, mosaics and spiky quatrefoils.